A research project led by leading Australian universities is testing which horticultural species in our future urban landscapes will thrive or struggle in the face of a changing climate. Climate change is an issue that can affect the entire horticultural sector, especially the nursery industry, where the commercial objective is to sell healthy plants that have a long and productive life. Known as “Which Plant Where” the research project is being conducted by Macquarie University and Western Sydney University, with funding from Hort Innovation’s Green Cities Fund. The project involves testing a range of plants under various climatic conditions in a controlled environment, as well as conducting “Living Labs” to monitor plant growth and survival rates in a real life setting. A living lab is now underway at the Underwood Reserve in Summer Hill, Sydney. Provided by the Inner West Council, researchers will monitor the performance and associated benefits of recently planted trees and shrubs in the reserve over time. The Council itself plants around 1,000 trees per annum. Speaking at the recent Living Lab Launch, the Council’s Urban Forest manager, Gwilym Griffiths, knows urban areas are highly contested spaces and reiterates the need to ‘get it right’. “The challenges are only going to increase, with increased heat and further development of urban areas, so when we plant trees, we really need to make sure we’re maximising their success,” he said. While the core of the research is to understand how plants will evolve in a changing environment, the project also looks at the co-benefits of plants, including the positive impacts of canopy cover and how shrubs support soil structure. This information will equip growers, councils and the community about the best plant combinations for capturing pollutants, increasing urban cooling and soil health, and supporting biodiversity. The Living Labs are a great example of building confidence in growers and practitioners. They provide evidence based on how a plant performs under a range of extreme conditions, and will help to guide future production trends for growers. 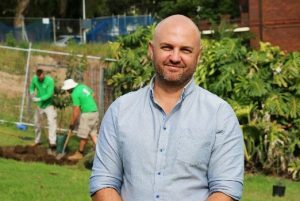 Photo caption: Gwilym Griffiths, Urban Forest Manager, Inner West Council.